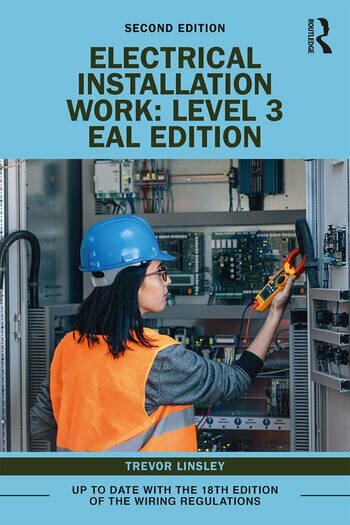 Updated in line with the 18th Edition of the Wiring Regulations and written specifically for the EAL Diploma in Electrical Installation, this book has a chapter dedicated to each unit of the EAL syllabus, allowing you to master each topic before moving on to the next. This new edition also includes a section on LED lighting. End of chapter revision questions help you to check your understanding and consolidate the key concepts learned in each chapter. A must have for all learners working towards EAL electrical installations qualifications. Trevor Linsley was formerly Senior Lecturer in Electrical Engineering at Blackpool and the Fylde College of Technology. There he taught subjects at all levels from first year trainee to first year undergraduate courses; and was also head of the multidiscipline NVQ Assessment Centre and responsible for establishing and running the AM2 Electrical Skills Assessment Centre. He has had 27 books published and has also written many bespoke training packages for local SME electrical engineering companies in the North West of England.